The trip to the crater lake Lake Awing was already very productive. A young Banded Wattle-eye (Platysteira laticincta) and one of the parents could already be seen along a ridge above the lake. A very dark bird with a yellow eyebrow is the Black-billed Weaver (Ploceus melanogaster). Still and inconspicuous, a completely green bird hatches through the branches. I had separated myself a bit from the group, which with a lot of finger-pointing and noise observe ascending birds from the lower parts of the surrounding forest of the lake. A green and yellow bird which appears is probably the often concealed Cameroon Greenbul or Cameroon Montane Greenbul. Unfortunately, I can only shoot a few blurred images. But back to the Cameroon Olive-Greenbul. Its distribution area is characterized by the occurrence in mid-altitude and montane forest between 750 m and 2200 m asl. These birds occur in pairs or small (family) groups and are occasionally seen in mixed bird flocks. The Cameroon Olive Greenbul is insectivorous, but also does not reject fruits. We are able to observe the bird extensively on the moss and lichen-grown branches. Again and again, the bird clings to the sides of trunks and branches and inspects peeling bark, bark splits and mosses. 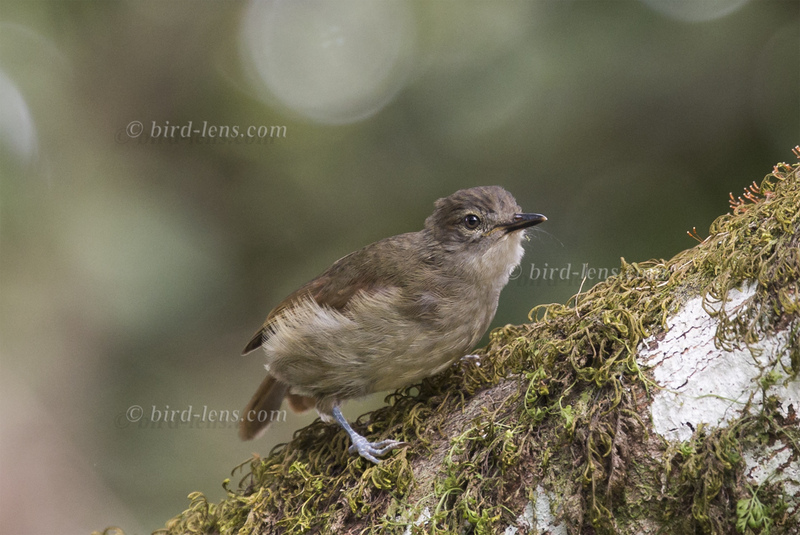 The guide shouts the statement that the Cameroon Olive-Greenbul is a rarely photographed bird endemic. The Internet has very few photos – as seen on the internet bird collection of the Handbook of the Birds of the World http://www.hbw.com/species/cameroon-olive-greenbul-phyllastrephus-poensis. Anyway, the situation is amazing. The Cameroon Olive-Greenbul inspects obviously just in front of us the mosses on a thick branch directly above the path. The bird can be photographed with some exercise. Despite – or because of the proximity – the focus on this fast-paced bird is not so simple. The Greenbul quickly disappears behind a branch, cannot be seen for seconds and then re-emerges 1-2 meters higher in the branches. Since it needs a good, handy equipment, which I had – lenswise – with the 400er DO from Canon. The EOS 1 DX plays its role as an professional tool by the fast response technology. Cameroon Olive Greenbul is a range-restricted species which is present in this visited part of the Cameroon Mountains near Bamenda in western Cameroon. The Bamenda-Banso highlands are part of the Cameroon Highlands ecoregion. This ecoregion comprises montane forest/grassland patches mainly above 900 m asl. Geographically this ecoregion encompasses the mountains and highland areas of the border region between Nigeria and Cameroon. Although located in tropical Africa the mean maximum temperatures are below 20°C due to the effects of altitude. The combination of fertile volcanic soil with adequate rainfall contributes to a high human population density. In order to satisfy the growing demand for top shots of the rarer species of Palearctic, Bird-lens.com has undertaken targeted trips to distant bird areas and destinations nearby. This is to be able to do anything to provide excellent images of the birds of the Western Palearctic. Additionally bird-lens.com is keen to provide images of other birds of other parts of the world – especially if these birds are rarely photographed. The results in images of rare birds are very good. Very nice images bird-lens.com could be brought back from all over the world. The beautiful image of the blog is only first impressions of what you will find in behind “Picture Shop” for the Cameroon trip very soon. Simply contact bird-lens.com if you need an image of a bird before even more new pictures are online.